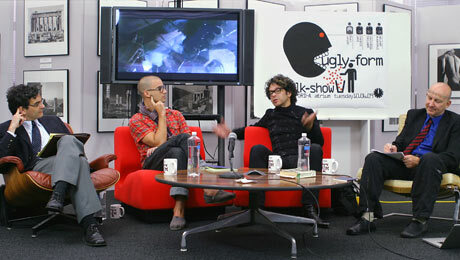 An hour-long panel discussion ranging from pop culture to architectural phenomenology, from the Jonas Brothers to German philosopher Martin Heidegger, with numerous poignant and esoteric points in between filled the first episode of “talk-show,” a live webcast that aired Oct. 6 from the Texas A&M College of Architecture’s Wright Gallery. The happening, orchestrated in front of a live audience by “talk-show” host Peter Lang, associate professor of architecture, provided a roomful of College of Architecture students and faculty with a familiar pop alternative to traditional scholarly debate formats. Pictured above: from left, Theodore George, Joshua Bienko, Gabriel Esquivel, and host Peter Lang. Bryan Trubey ’83, designer of Cowboys Stadium, presented the College of Architecture’s Spirit and Place medal to Cowboys owner Jerry Jones. From left are Jorge Vanegas, college dean, Trubey, Jones, and Jones’ wife, Gene Jones. 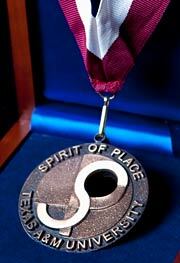 For his role in the creation of Cowboys Stadium, Dallas Cowboys owner Jerry Jones received Texas A&M College of Architecture’s inaugural Spirit of Place Award, a medallion “recognizing projects that celebrate people and place,” said Jorge Vanegas, dean of the college. 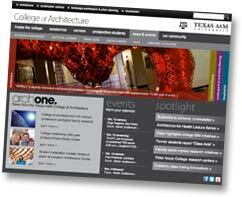 The College of Architecture at Texas A&M went live 9/9/09 with the first phase of its ongoing website renovation, a project aimed at providing a more user-friendly interface combining ease of navigation with useful content that better reflects the aims and culture of the institution. The new site was designed to address problems and desires articulated by site visitors in an online survey conducted last fall. Survey respondents included current, potential and former students, as well as parents, faculty and members of the larger academic, professional and service communities. The 11th Annual Texas A&M College of Architecture Research Symposium: Built, Natural Virtual will be held Monday, Oct. 19 at the Langford Architecture Center on the Texas A&M campus. The daylong research showcase, which begins at 8:30 a.m., features a series of faculty presentations previously delivered at scholarly venues around the world. This year’s symposium includes invited or refereed presentations and papers from the 2008-09 academic year. Sam Gosling, a nationally renowned researcher and author who focuses on issues related to personality and social psychology, will be the keynote speaker at the Texas A&M College of Architecture Research Symposium: Built, Natural Virtual. The 11th annual symposium will be held Oct. 19 at the Langford Architecture Center on the Texa A&M campus. Dr. Kenneth Williamson III, associate professor and associate head in the Department of Construction Science at Texas A&M, is co-principal investigator with his wife, Dr. Vickie M. Bentley-Williamson, senior lecturer in chemistry at Texas A&M, who is principal investigator, in a National Science Foundation-funded study to determine how individual differences among students might influence the effectiveness of visualizations for learning perceptually difficult concepts. Urban planning professor Sam Brody, the new holder of the George P. Mitchell ‘40 Chair in Sustainable Coasts at Texas A&M University at Galveston and a faculty fellow with Texas A&M’s Hazard Reduction and Recovery Center, is facilitating the center’s expansion to the university’s Galveston campus, putting the center at the doorstep of one of its major research areas. Brody’s said his joint appointment to the faculty of the Department of Landscape Architecture and Urban Planning at the College Station campus, and to the Department of Marine Sciences in Galveston, will foster collaboration between the two research centers. A team of architecture professors at Texas A&M is aiming to improve buildings’ design and energy efficiency by providing standards for data exchange among disparate building design software systems through research from a national engineering society’s 15-month, $175,000 grant. Studies have shown that problems related to exchanging information among building information modeling software used by architects and energy analysis and simulation software used by engineers causes more than $16 billion per year of unnecessary expenses. A professor of urban planning at Texas A&M is partnering with civil engineering and public service scholars to research the development of emergency procedures for water utility operators. Plans of action for real-time utility response are difficult to design, the researchers wrote, based on the range of uncertainty and variability in the location, time, type and duration of contaminant. The researchers are planning to use agent-based models (ABM) to simulate the interactions of utility operators, consumers and public health agencies and their impact on the propagation of the contaminant. Urban planning researchers at Texas A&M discovered a notable difference in motorists’ safety around strip malls as compared to “main street” type developments. “We found urban arterials, arterial-oriented commercial developments, and big box stores to be associated with increased incidences of traffic-related crashes and injuries, while higher-density communities with more traditional, pedestrian-scaled retail configurations were associated with fewer crashes,” wrote Eric Dumbaugh, assistant professor of urban planning at Texas A&M, and Robert Rae, a former student who now works as an analyst with Kimley-Horn and Associates. Writing for The City Fix, a website focusing on sustainable urban mobility, Erica Schlaikjer quoted Dumbaugh and Rae’s conclusion that more management of mobility and access of urban arterials, relocation of retail outlets to lower-speed thoroughfares, and better land use planning can address the problem. 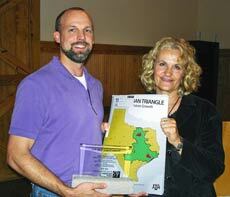 “Texas Urban Triangle: Framework for Future Growth,” a 140-page report researched by Texas A&M urban planning students, was named Best Student Project by the Central Texas section of the American Planning Association during a July 17 banquet in Bastrop. The report, issued in May 2008, researched key strategic factors shaping the future growth of the mega-region, including current and future needs for water, energy, housing, education, transportation, and other infrastructure. Pictured above: Graduate student Nathanael Proctor and Elise Bright, professor of urban planning and master of urban planning coordinator, accepted an award from the American Planning Association. Participants at the The National Academies’ Sept. 23 sustainability forum heard Walter Gillis Peacock, a Texas A&M urban planning professor, lecture on the resiliency and vulnerability of Texas coastal communities and make a pitch for the creation of RAVON, a proposed Resiliency and Vulnerability Observatory Network. Participants at the international SIGGRAPH (short for Special Interest Group on GRAPHics and Interactive Techniques) conference in New Orleans had the opportunity to experience birds’ ultraviolet vision and whales’ ultrasonic hearing, titled “I’m Not There,” by donning 3-D glasses and using a Wii controller to navigate through the exhibit. SIGGRAPH, the premier international computer graphics and interactive techniques conference, featured a host of presenters from Texas A&M’s Department of Visualization during its August 3-7 run at the Morial Convention Center in New Orleans. One presentation involed an immersive exhibit that allowed participants to experience the world through sensory perceptions of animals. “The exhibit shows what it might be like to see with birds’ ultraviolet vision or hear with whales’ ultra-low frequency hearing,” wrote Jason Palmer, BBC News science and technology reporter, in an article on the BBC’s website. Georgina Davis is at McMurdo Station in Antarctica studying how the design and engineering elements of the station’s buildings affect researchers’ productivity and well-being, as well as the structures’ energy efficiency. LAUP faculty meets10:30 a.m. - noon in the Wright Gallery. For more information, please contact Debby Bernal at 845-1019 or dbernal@tamu.edu. “Senior Living Trends,” a lecture featuring Ronald B. Blitch, of Blitch/Knevel Architects in New Orleans, is set for noon, Friday, Oct. 9 at the 4th floor, Architecture-for-Health studio in Langford A. The lecture is part of the Fall 2009 Architecture for Health Lecture Series, “Toward a Sustainable and Healthy Future in the Context of Health Reform,” sponsored by the Center for Health Systems & Design, the CHSD Health Industry Advisory Council, Student Health Environments Association, Global University Programs in Healthcare Architecture, the Department of Architecture, the Department of Architecture and the Texas A&M Health Science Center. 8th Annual HIAC Meeting: Members of the Center for Health Systems & Design’s Health Industry Advisory Council gather for updates on architecture-for-health initiatives at the College of Architecture. For more information, contact Judy Pruitt at 979.845.7009 or jpruitt@tamu.edu. Hugo Segawa lecture: Hugo Segawa, an associate professor at the the University of Sao Paulo’s School of Architecture and Urbanism, will lecture at 5 p.m. on Monday, October 12 as part of the Department of Architecture Lecture Series. Segawa is the author of several books and articles on Brazilian and international architecture. For more information, contact Hala Gibson at 979.845.0129. “Art:21 — Art in the 21st Century”: A pre-broadcast screening of a select episode of the PBS series “Art:21 — Art in the Twenty-First Century,” will be held 5 p.m. Oct. 12 in Langford C105. 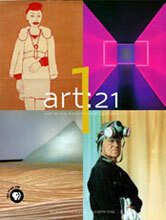 “Art:21” is the only series on television to focus exclusively on contemporary visual art and artists in the United States, and it uses the medium of television to provide an experience of the visual arts that goes far beyond a gallery visit. Fascinating and intimate footage allows the viewer to observe the artists at work, watch their process as they transform inspiration into art, and hear their thoughts as they grapple with the physical and visual challenges of achieving their artistic visions. For more information contact Carol Lafayette at lurleen@viz.tamu.edu or see the PBS website at www.pbs.org/art21. Germany Study Abroad 2010 Orientation is slated 5:30 - 7:30 p.m. in Langford C207. For more information, contact Olga Catalena at 979.845.0544 or ocatalena@tamu.edu. “Health by Design,” a lecture featuring Kirk Teske, principal and chief sustainability officer with HKS in Dallas, is set for noon, Wednesday, Oct. 14 at the 4th floor, Architecture-for-Health studio in Langford A. The lecture is part of the Fall 2009 Architecture for Health Lecture Series, “Toward a Sustainable and Healthy Future in the Context of Health Reform,” sponsored by the Center for Health Systems & Design, the CHSD Health Industry Advisory Council, Student Health Environments Association, Global University Programs in Healthcare Architecture, the Department of Architecture, the Department of Architecture and the Texas A&M Health Science Center. Sigma Lambda Chi new member meeting is scheduled 6 – 8 p.m. in Langford C111. Sigma Lambda Chi is the construction honor society that is for selected members based on their academic achievements. For more information, contact Dori Binion at doribinion@aol.com. Aggie SWAMP Club meets 7:30 p.m. Thursday, October 15 in Langford C 307. Aggie SWAMP Club is the official filmmaking organization of Texas A&M. 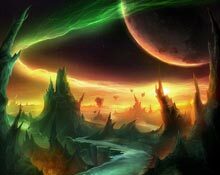 SWAMP stands for ScreenWriting, Acting, & Movie Production. It is a resource for Aggies interested in making movies or studying the film process. In addition to weekly meetings, there are various weekend workshops throughout each semester, weekly socials, and there’s always an independent film project going on in SWAMP in need of cast or crew. For more information, contact Carol LaFayette at 845-5691 or lurleen@viz.tamu.edu. Hunter Goodwin of Oldham Goodwin Group will be a guest lecturer for the REDA lecture series. The lecture is slated 7 – 9 p.m. in the Wright Gallery. Real Estate Development Association, or REDA, provides opportunities for students interested in real estate development to take part in field trips, lectures and other student activities in the real estate industry. For more information, please contact Michael Miller at mdmiller3@neo.tamu.edu. Department of Architecture Advisory Council meets 8 a.m. – 5 p.m. Friday, Oct. 16 and Saturday, Oct. 17 in the Wright Gallery. For more information contact Mallory Schramm at 979-845-1015 or mschramm@archmail.tamu.edu. Case Study Writing Workshop for the Built Environment will take place 9 a.m. – 3 p.m. in Langford A 205. Harold Hogan from Harvard and Patrick Harvey from The University of Hong Kong will be guest speakers. Harold Hogan has authored or co-authored more than 50 case studies for the Harvard Business School MBA and Executive Education programs. Harvey is the assistant dean for executive programs and special projects at the University of Hong Kong. He is also adjunct associate professor of accounting in the Faculty of Business and Economics. For more information, contact Mashalle Gomez at 979.862.8443 or mgomez@archmail.tamu.edu. 11th College Research Symposium — “Natural, Built, Virtual: College of Architecture Research Symposium 2009,” the annual daylong showcase of faculty research at the Texas A&M College of Architecture will be held all day in classrooms throughout the Langford Architecture Center. For more information on the Call for Papers, event registration or the day’s agenda, contact Trisha Gottschalk, 845.2030 or trishag@tamu.edu. Paul Preissner lecture: Paul Preissner, founder of Paul Preissner Architects LTD, will lecture 5 p.m. Monday, Oct. 19 in the Preston Geren Auditorium as part of the Department of Architecture Lecture Series. As a full service architectural office Paul Preissner Architects LTD provides planning services, building design, interior design and landscape design. For more information contact Hala Gibson at 979-845-0129. Spain Study Abroad 2010 Orientation is slated 6 - 7:30 p.m., Langford C 207. For more information, contact Katy Dunn at Kdunn@archmail.tamu.edu. Italy Orientation is slated 5:30 p.m. - 7:30 p.m. in Langford C 207. For more information, contact Olga Catalena 979.845.0544 or ocatalena@tamu.edu. “On the Ground in South Africa,” a lecture featuring Glenn Mills, professor and head of the Department of Architecture at Texas A&M University, is set for noon, Wednesday, Oct. 21 at the 4th floor, Architecture-for-Health studio in Langford A. The lecture is part of the Fall 2009 Architecture for Health Lecture Series, “Toward a Sustainable and Healthy Future in the Context of Health Reform,” sponsored by the Center for Health Systems & Design, the CHSD Health Industry Advisory Council, Student Health Environments Association, Global University Programs in Healthcare Architecture, the Department of Architecture, the Department of Architecture and the Texas A&M Health Science Center. Aggie TSA Reception: As part of the Texas Society of Architects 70th Annual Convention in Houston, the Texas A&M Department of Architecture is holding a reception 7 – 9 p.m. Oct. 22 at WHR Architects, 1111 Louisiana St., 26th Floor, Houston, TX 77002. The event includes hors d’oeuvres and a host bar. The gathering will provide an opportunity for former students and friends of the department to gather, reminisce, meet new friends, celebrate recent accomplishments and share visions for the future. Please RSVP by October 15, 2009 to Melinda Randle at 979.847.8918 or mrandle@archmail.tamu.edu. Aggie SWAMP Club meets 7:30 p.m. Thursday, October 22 in Langford C 307. Aggie SWAMP Club is the official filmmaking organization of Texas A&M. SWAMP stands for ScreenWriting, Acting, & Movie Production. It is a resource for Aggies interested in making movies or studying the film process. In addition to weekly meetings, there are various weekend workshops throughout each semester, weekly socials, and there’s always an independent film project going on in SWAMP in need of cast or crew. For more information, contact Carol LaFayette at 845-5691 or lurleen@viz.tamu.edu. REDA Meeting is slated 7 – 8 p.m. in Langford A 348. Real Estate Development Association, or REDA, provides opportunities for students interested in real estate development to take part in field trips, lectures and other student activities in the real estate industry. For more information, please contact Debby Bernal at 845-1019 or dbernal@tamu.edu. A college staff retreat is slated 8 a.m. - 5 p.m. at the Texas A&M Riverside Campus Chapel. Staff will participate in team building exercises; door prizes, a guest speaker and enjoy an on-site catfish fry with all the fixings catered by Buppy’s. For more information, contact Susie Billings at sbillings@archmail.tamu.edu. Germany Study Abroad 2010 Orientation is scheduled 5:30 - 7:30 p.m. in Langford C 207. For more information, contact at Olga Catalena 979.845.0544 or ocatalena@tamu.edu. “Design and Health,” a lecture featuring Alan Dilani, Ph.D., general director of the International Academy for Design and Health in Stockholm, Sweden, is set for noon, Wednesday, Oct. 28 at the 4th floor, Architecture-for-Health studio in Langford A. The lecture is part of the Fall 2009 Architecture for Health Lecture Series, “Toward a Sustainable and Healthy Future in the Context of Health Reform,” sponsored by the Center for Health Systems & Design, the CHSD Health Industry Advisory Council, Student Health Environments Association, Global University Programs in Healthcare Architecture, the Department of Architecture, the Department of Architecture and the Texas A&M Health Science Center. “Healthcare Architecture in the Great White North,” a lecture featuring Bruce Raber, vice president and healthcare practice leader, and Ray Pradinuk, principal and leader of healthcare research and innovation, both with Stantee Architecture in Vancouver, British Columbia, will follow the previously listed noon lecture, Wednesday, Oct. 28 at the 4th floor, Architecture-for-Health studio in Langford A. The lecture is part of the Fall 2009 Architecture for Health Lecture Series, “Toward a Sustainable and Healthy Future in the Context of Health Reform,” sponsored by the Center for Health Systems & Design, the CHSD Health Industry Advisory Council, Student Health Environments Association, Global University Programs in Healthcare Architecture, the Department of Architecture, the Department of Architecture and the Texas A&M Health Science Center. 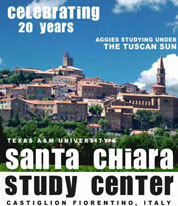 Italian Study Abroad Reunion: Texas A&M is celebrating 20 years of Aggies studying under the Tuscan Sun. Current and former students who studied at Texas A&M’s Italian venues, including La Poggerina and the Santa Chiara Study Center, are invited to join Paolo Barucchieri, Santa Chiara director, for a reunion on the Texas A&M campus in College Station. Interested parties are urged to hold the dates as details will be forthcoming. A reception will be held Thursday, Oct. 29 and class reunions and an evening banquet are in the works for Friday, Oct. 31. Participants can stick around for Saturday to watch the Aggies beat the hell out of Iowa State. A block of tickets will be reserved for those attending the reunion. Event details and updates will be posted on the event website: studyabroad.tamu.edu Interested participants are urged to e-mail Italyfriends@ipomail.tamu.edu. “talk-show” eyes Awful/Beauty: “talk-show,” a live webcast taped in front of a live audience in the Langford Architecture Center’s Wright Gallery is scheduled for noon Thursday, Oct. 29. "talk-show" guests will examine the topic “Awful/Beauty” — beauty and the sublime — asking if we can do with one and not the other. Joining host Peter Lang, associate professor of architecture, in the limelight will be guests Sarah DeJong and Gabriela Campagnol, assistant professors of architecture at Texas A&M, and other guests to be announced. The video broadcast can be viewed through TTVN, The Texas A&M University System’s wide area data and interactive communications network, which can be accessed online at ttvn2.tamu.edu. Aggie SWAMP Club meets 7:30 p.m. Thursday, October 29 in Langford C 307. Aggie SWAMP Club is the official filmmaking organization of Texas A&M. SWAMP stands for ScreenWriting, Acting, & Movie Production. It is a resource for Aggies interested in making movies or studying the film process. In addition to weekly meetings, there are various weekend workshops throughout each semester, weekly socials, and there’s always an independent film project going on in SWAMP in need of cast or crew. For more information, contact Carol LaFayette at 845-5691 or lurleen@viz.tamu.edu. Spain Study Abroad 2010 Orientation will take place 6 - 7:30 p.m. in Langford C 207. For more information, contact Katy Dunn at Kdunn@archail.tamu.edu. ARCH faculty meets noon – 1 p.m. Tuesday, Nov. 3 in the Wright Gallery. For more information contact Hala Gibson at 979.845.0129 or hgibson@tamu.edu. Italy Study Abroad 2010 Orientation is scheduled 5:30 - 7:30 p.m., Langford C 207. For more information, contact Olga Catalena at 979.845.0544 or ocatalena@tamu.edu. “Hospital Design: Lessons Learned as a Medical Student,” a lecture featuring Diana Anderson of WHR Architects in Houston, is set for noon, Wednesday, Nov. 4 at the 4th floor, Architecture-for-Health studio in Langford A. The lecture is part of the Fall 2009 Architecture for Health Lecture Series, “Toward a Sustainable and Healthy Future in the Context of Health Reform,” sponsored by the Center for Health Systems & Design, the CHSD Health Industry Advisory Council, Student Health Environments Association, Global University Programs in Healthcare Architecture, the Department of Architecture, the Department of Architecture and the Texas A&M Health Science Center. Aggie SWAMP Club meets 7:30 p.m. Thursday, Nov. 5 in Langford C 307. Aggie SWAMP Club is the official filmmaking organization of Texas A&M. SWAMP stands for ScreenWriting, Acting, & Movie Production. It is a resource for Aggies interested in making movies or studying the film process. In addition to weekly meetings, there are various weekend workshops throughout each semester, weekly socials, and there’s always an independent film project going on in SWAMP in need of cast or crew. For more information, contact Carol LaFayette at 845-5691 or lurleen@viz.tamu.edu. Artist in Residence Lecture – Internationally acclaimed artist Judy Pfaff will visit at 5:30 – 8 p.m. on Monday, Nov. 9 in Langford C-105. Pfaff will visit classes and students and wrap up with a lecture and visual presentation on her artwork. This event is supported by the Academy for the Visual and Performing Arts. For more information contact Carol LaFayette at 979-845-5691 or lurleen@viz.tamu.edu. Alex Pincus lecture: Alex Pincus, a principal at Bureau V and a partner at an art production agency in Los Angeles called XV, will lecture at 5 p.m. Monday, Nov. 9 in the Preston Geren Auditorium as part of the Department of Architecture Lecture Series. Pincus, an architect and educator, has taught architecture at Columbia University, the University of Pennsylvania, and is currently a visiting professor in the Design Energy Inititive at the University of Kentucky School of Architecture. Prior to founding Bureau V, Pincus worked at Eisenman Architects, Archi-Tectonics and most recently, Asymptote Architecture. As a senior designer for Asymptote, he led the design of the international competition winning Budapest Bank Towers in Hungary, the Strata Tower in Abu Dhabi, UAE, and the Volkswagen Knowledge Gate in Wolfsberg, Germany. For more information contact Hala Gibson at 979-845-0129. Germany Study Abroad 2010 Orientation is slated 5:30 - 7:30 p.m. in Langford C 207. For more information, contact Olga Catalena at 979.845.0544 or ocatalena@tamu.edu. “Sustained Health,” a lecture featuring Don Taylor, president of Team Integrated Engineering, Inc. in San Antonio, is set for noon, Wednesday, Nov. 11 at the 4th floor, Architecture-for-Health studio in Langford A. The lecture is part of the Fall 2009 Architecture for Health Lecture Series, “Toward a Sustainable and Healthy Future in the Context of Health Reform,” sponsored by the Center for Health Systems & Design, the CHSD Health Industry Advisory Council, Student Health Environments Association, Global University Programs in Healthcare Architecture, the Department of Architecture, the Department of Architecture and the Texas A&M Health Science Center. “Sustainable Design for Healthy Hospital Environments and Positive Human Outcomes,” a lecture featuring Debra Harris, president and CEO of RAD Consultants in Austin, is set for noon, Friday, Nov. 13 at the 4th floor, Architecture-for-Health studio in Langford A. The lecture is part of the Fall 2009 Architecture for Health Lecture Series, “Toward a Sustainable and Healthy Future in the Context of Health Reform,” sponsored by the Center for Health Systems & Design, the CHSD Health Industry Advisory Council, Student Health Environments Association, Global University Programs in Healthcare Architecture, the Department of Architecture, the Department of Architecture and the Texas A&M Health Science Center. Outstanding Alumni Banquet: The College of Architecture will honor 11 new Outstanding Alumni Nov. 13 at the Miramont Country Club. Pictured from the top left are: Don Austin BSLA ’52; James Foster B-ARCH ’66, MARCH ’69; Robert (Bob) Hunter B-ARCH ’67, MARCH ’71; Nancy McCoy BED ’81; Jeff Potter BED ’78 MARCH ’79; Shelley Potter BLA ’78; Anthony Schirripa BDCR, BED ’73; James Snyder BED ’78, MARCH ’80; Lars Stanley BED ’74; Keith Williams BDCR ’78, MSCM ’80; and Norfleet Bone LAND ‘23 (posthumous award). A cocktail reception begins 6 p.m. Friday followed by dinner at 7 p.m. For more information contact Trish Pannell at t-pannell@tamu.edu. 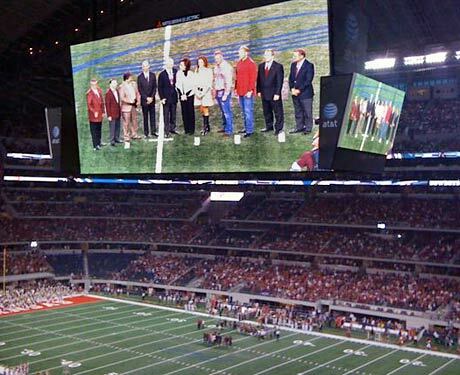 When dignitaries from Texas A&M University and the University of Arkansas gathered on the Cowboys Stadium field for the inaugural presentation of the College of Architecture’s Spirit of Place Award to Cowboys owner Jerry Jones, Tim McLaughlin, head of the Department of Visualization, used his cell phone camera to capture this image of the VIPs on the stadium’s gigantic video boards. The presentation was made prior to the start of the Oct. 3 Aggie-Razorback showdown. See story for details.